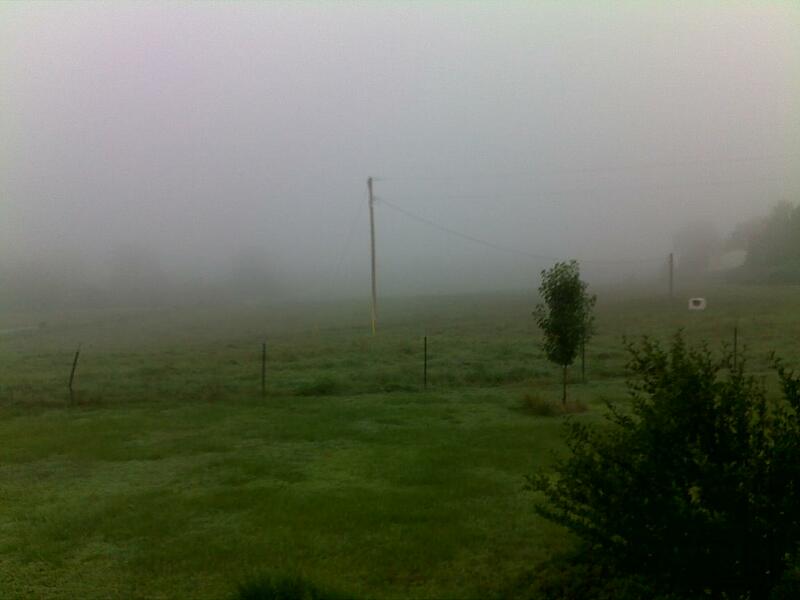 The fog started rolling in a few minutes before 6:00 this morning, a sure sign that it's going to be another muggy day here in northwest Alabama. Though it won't be terribly comfortable, we already have three hours of work under our belts this morning and might as well go for 8 or so more! We'll have one tractor back in the cornfields this morning trying to clean up the weed problems while I "burn-down" a couple of other fields in preparation to no-till plant some late season silage corn. We have enough seed to plant 45 acres, which is how much acreage we have in Yellow Creek bottom. However, it looks like we'll never get all of that acreage dried out before our corn planting window closes. So, we'll plant as much as we can in the bottom then finish out in a couple of our upland fields (17 acres worth). Hopefully we'll be able to use most of that seed in the bottom and can go back to our original plan of planting sudex on those two other fields. Speaking of sudex, we'll probably be drilling that into our milking herd's grazing pastures next week. The ryegrass has just about played out and the cows are making their final pass through each of the paddocks. So last week was mostly focused on herd health, this week is on weed control, next week should be planting, and the week after that? Harvesting bermudagrass hay, hopefully! Quickly, a couple of words about Alabama politics. John McMillan and Dorman Grace, the two most qualified GOP candidates for Commissioner of Agriculture and Industries, are headed towards the Republican Party's July run-off ballot. The winner of that election will go on to face unchallenged Democrat Glen Zorn in the November general election. Also, congrats to fellow young farmer Clay Scofield for pulling in the most votes for the GOP's nomination for State Senate District 9's seat. Best of luck in the run-off, Clay! Have a "dairy" good Wednesday, everyone! Enjoyed you post and just hit "follow" at the top of your page. Grew up on a Nebraska dairy farm a half century ago, and while ag has changed a lot since then, maybe you'd be surprised at how much of it hasn't. You could be my dad talking when I was 10 years old.